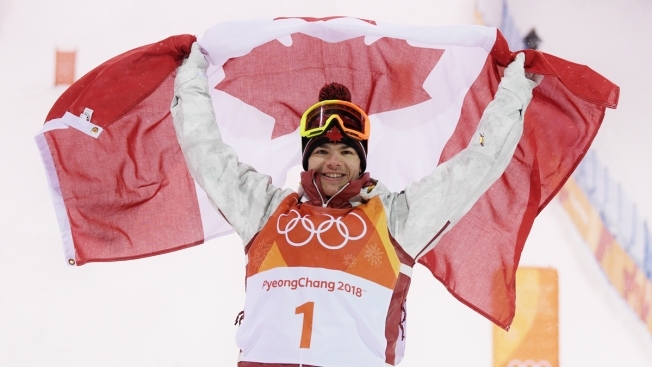 Gold medalist Mikael Kingsbury of Canada celebrates winning the Freestyle Skiing Men's Moguls Final. Kingsbury, a six-time world champion and silver medalist in Sochi four years ago, posted a score of 86.63, the best of any in the three elimination rounds. His victory gives Canada its third straight Olympic gold in the event. A rare wobble in the 2014 Olympic finals cost Kingsbury the top spot on the podium. There were no mistakes this time. Kingsbury celebrated with a fist pump following his electric winning run at a frigid Phoenix Snow Park. Matt Graham of Australia took silver, with Daichi Hara of Japan earning bronze. Canada's Marc-Antoine Gagnon finished fourth and American Casey Andringa made a surprise run to the finals before winding up fifth.